China’s largest offshore oil producer, China National Offshore Oil Corp (CNOOC), said unconventional oil and gas production in its United States partnerships totaled 3 million to 4 million barrels this year. “We expect annual production to hit 8 million barrels as we put more capital into the wells,” said Zhu Weilin, executive vice-president of CNOOC Ltd.
China is estimated to hold more natural gas trapped in shale than the US, according to the US Energy Information Administration in April. Shale gas is among the largest onshore energy prospects in China. 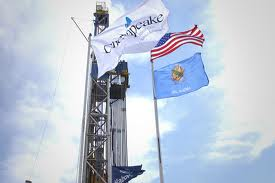 CNOOC paid $570 million for a 33.3-percent stake in Chesapeake Energy Corp’s Niobrara shale project in Colorado and Wyoming in February this year. Last November, the company made a $1.8-billion purchase for a one-third stake in Chesapeake’s Eagle Ford project in south Texas. He said his company is looking for opportunities with US companies in deepwater exploration as well as shale gas and oil. “CNOOC has 19 offshore blocks in China that we are looking for foreign partners to co-develop,” said Zhu at the recent China-US Relations Conference. Industry analysts said China is paying a high premium for the partnerships while others have said Chinese is learning new exploration techniques through the projects. The prices China’s State-owned oil companies have paid for assets are mixed; in some cases, they may have paid above market value but recent economic conditions, good financial performances, and growing experience with international deals have benefited the companies, according to a report by the International Energy Agency. Two-thirds of the USD 70 billion invested in 144 projects overseas by China’s three oil giants, Sinopec Group, China National Petroleum Corp and CNOOC, have not turned a profit thus far, according to a recent report by the China University of Petroleum and the China Petroleum and Chemical Industry Association. “Natural resources are one of the few sectors where the US government has stringent scrutiny because they are the strategic industries,” said Huang Yasheng, professor at the Sloan School of Management at the Massachusetts Institute of Technology. In 2005, CNOOC dropped its USD 18.5-billion bid for Unocal Corp because of opposition from US lawmakers. It would have been the largest overseas acquisition by a Chinese company. “Chinese companies should position themselves globally, rather than nationally,” said Xiang Bing, founding dean of the Cheung Kong Graduate School of Business, one of China’s leading business schools.